Cellulitis is an infection of the skin and the tissue just under the skin. It's often caused by a small break in the skin where bacteria (germs) can get in. Cellulitis can affect any area of skin, but the leg is the most common place. Cellulitis is most common in children and older people, but can affect people of all ages. Diabetes and other health conditions or treatments that reduce your immunity can make you more likely to get cellulitis. It usually starts with a small patch of redness and swelling, which can be painful and warm to touch. This can spread to cover a bigger area. If the infection spreads, you may get other symptoms such as nausea, fever, or generally feeling unwell. Cellulitis can lead to septicaemia (a life-threatening infection of the blood). So it's important that it's treated early. 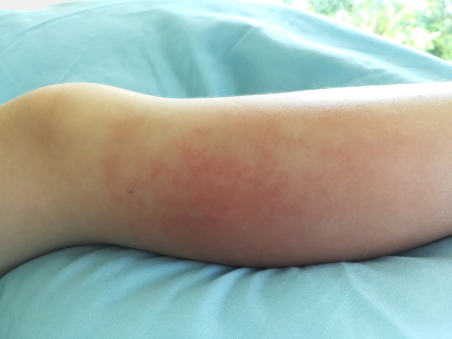 Cellulitis is treated with antibiotics. Usually your GP will ask you to take tablets. If the infection is more serious, you may need antibiotics given through a vein (IV antibiotics). Your GP may arrange for you to have IV antibiotics without needing to go to hospital. Resting the affected area, for example keeping your leg up, will help you heal quicker. If you have diabetes, keeping your blood sugar down is important. If you have a patch of skin that's red, warm and getting bigger, see your GP or After-hours healthcare service as soon as possible, especially if you have diabetes or any condition that reduces your immunity. Detailed information with a variety of photographs. A GP from the UK health system talks about treating cellulitis.